Every Christmas, for as long as I can remember, my family has been supplied with freshly-baked Lebkuchen from the Sommermann Bäckerei in Lippertsgrün, Germany. I loved it when the big boxes, carefully tied with twine, arrived from Germany in early December. The first whiff from the newly-opened box--the fragrance of spices and smells from the homeland--was a treat in itself. My Opa and Oma tucked those boxes full of Christmas specialties from their bakery: traditional Bavarian Christmas cookies, chocolate, Lebkuchen, and sometimes even a Quarkstollen, all made by hand. But that is just the basic form. The only kind of Lebkuchen I'm willing to call Lebkuchen is made of chopped nuts, candied citrus peel, spices, and minimal amounts of flour and spread over a base of oblaten. Oblaten are akin to communion wafers. In fact, the monks who developed the earliest Oblaten Lebkuchen recipes used actual communion wafers to keep the cookies from sticking to the baking sheets! Lebkuchen were first made in the Middle Ages by monks living in Franken, a northern Bavarian district in and around the city of Nürnberg (a.k.a. Nuremberg, in American). The meaning of Lebkuchen is uncertain. "Kuchen" means "cake," but the "Leb" part of the word could be translated a number of ways. Laib = body, Labla = dialect for bread, Leben = life... I guess the name could be considered a fusion of words that all have a spiritual connotation, which is in keeping with its origin in monastic bakeries. The dough contains at least 25% almonds and/or hazelnuts and/or walnuts. Other oilseeds are not used. There is also strict protection of the appellation; to be called "Nürnberger Lebkuchen," the Lebkuchen must be manufactured within the city boundaries. My grandfather was, and since his passing my uncle now is, Der Bäcker aus dem Frankenwald. (In English, "the baker of the Franconian Forest.") The Frankenwald, a forest now predominantly composed of fir trees, is the forest of fairy tales, and the things my relatives have been baking are the stuff of dreams. Years ago, an old lady from Nürnberg gifted a recipe for Elisen Lebkuchen to my grandfather while he was still an apprentice. 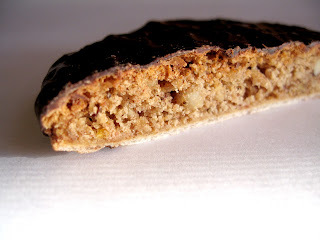 Over the years, he and my uncle have refined the recipe, adding a little of this and adjusting a little of that to make the most exquisite Elisen Lebkuchen ever. The recipe is a family secret, which only the master baker knows. Believe me, I don't know it, so I can't share it with you! What I do know is the general ingredients list, as stated on the packaging: "sugar, fresh eggs, hazelnuts, almonds, marzipan, fine flour, selected dried fruits, noble spices, lemon, salt of hartshorn, and melted chocolate." Today, the Elisen Lebkuchen in the Sommermann Bakery are finished off in one of two ways. Some, as pictured here, are covered by a thin layer of bittersweet chocolate; others are hand-decorated with three almond halves and brushed with a thin sugar glaze. My Opa used to put extra almonds on top the sugar-glazed Lebkuchen he sent us, and he used to arrange some of them to spell out the initials of his grandchildren. I was always so excited to discover a Lebkuchen with a big "E" on it as we went through our canisters. Then there'd be an "A" for my sister and a "D" for my brother. I knew that far away in Germany, he was thinking of us out here in California. These Lebkuchen, tasty as they are, represent far more than just something yummy to nibble on this time of year. They remind me of my family's heritage, the history of my people, and the love my grandparents have always shown me. So for me, it is never Christmas without these Lebkuchen, a taste of the homeland. Thank you for sharing your tradition. My neighbor, who is German treated me to some Oblaten Lebkuchen and they are delicious! I would like to adopt this tradition for my family. Thank you!